Online Medical General Chemistry I is equivalent to a one semester course, and has been designed for individuals who need an Online Chemistry Course as a prerequisite to apply for admission to a graduate program in the health professions. The overall goal of this online chemistry lecture is to give the student interested in the health professions an introduction to general chemistry emphasizing the concepts that will be important for and provide the basis for the subjects the student will encounter in their future studies. The subjects covered in this course include components of matter, atomic theory, stoichiometry, chemical reactions and bonding, thermochemistry, gases, quantum theory, electron configuration, models of bonding, theories of covalent bonding, shapes of molecules and intermolecular forces of liquids and solids. Click here to see the syllabus for General Chemistry I. General Chemistry I is designed for the student to take the lecture and lab concurrently in order to earn four credits. For the full four credits, you must register for both CHEM1010 and CHEM1010L. For students who only need a specific portion of General Chemistry I, however, you have the option to take lecture only (CHEM1010 three credits) or lab only (CHEM1010L one credit). Click here to learn more about the laboratories that accompany Online Medical General Chemistry I. A college level algebra course must be completed before registering for this course. All prerequisite courses must have been completed successfully within the past seven years. 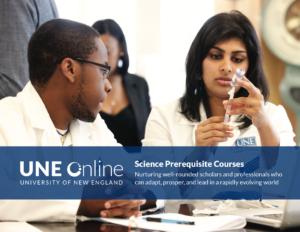 UNE offers several other online Chemistry courses, including Medical General Chemistry II, Organic Chemistry I and Organic Chemistry II, all of which are 100% online with labs available.